The St. Louis prosecutor in charge of the Ferguson grand jury today acknowledged that witnesses “absolutely lied under oath” before the panel, but said that none of the perjurers--including the unmasked "Witness 40"--would face criminal charges. During a KTRS radio interview, Prosecuting Attorney Robert McCulloch said that, “Early on I decided that anyone who claimed to have witnessed anything would be presented to the grand jury,” even if investigators questioned their truthfulness. 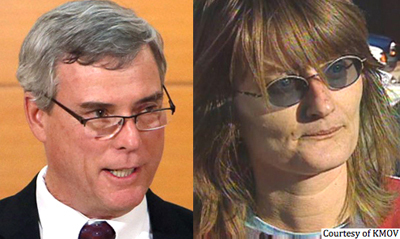 McCulloch (seen above left) said that he opted to present “anybody and everybody” to the grand jury, adding that it was the responsibility of panel members to judge the credibility of individual witnesses. Referring to “Witness 40,” whom TSG identified this week as a 45-year-old St. Louis woman named Sandra McElroy, McCulloch said she “clearly wasn’t present” when Michael Brown was shot to death by Officer Darren Wilson. McCulloch said that the woman’s sworn account was taken “right out of the newspaper,” adding that he believed grand jurors attached little credibility to her testimony.